Ah… Spring is in the air and we are finally outdoors cooking again! This dish features Panzanella which is a traditional Tuscan salad made with bread and tomatoes. Our take on Panzanella uses mushrooms instead of the tomatoes for that umami flavor which pairs nicely with the pork loin. 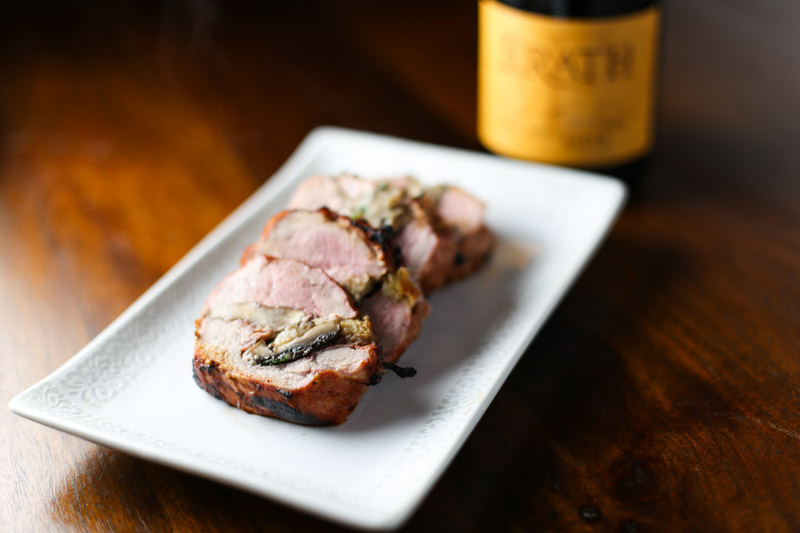 Now grab a bottle of your favorite Pinot Noir, sit back, and enjoy the recipe for Mushroom Panzanella and Prosciutto Stuffed Pork Tenderloin. This is such a wonderful dish and one we are anxious to share with you. There is a bit of prep to this recipe but none of it is very difficult. You just have to take your time and enjoy the process. A good bottle of wine helps tremendously! First you want to preheat your oven to 450° F. Next, in a large bowl, toss the mushrooms with olive oil and season with salt. Now place the mushrooms in a roasting pan and cook in the oven until the mushrooms are caramelized, around 20 minutes. Pull the mushrooms out of the oven and then in a large mixing bowl, toss the roasted mushrooms with the garlic, lemon juice, basil, endive, baby arugula, cheese and croutons. While that mixture cools you need to prep the Pork Loin. First you will butterfly the Pork tenderloin. Now you place the slices of Prosciutto on top of the Pork tenderloin. Once the cool put he Panzanella on top of the Prosciutto lined and butterflied Pork tenderloin. Roll the Pork Loin up being careful not to lose the filling. Tie the Pork tenderloin with butcher’s string. Cover with your favorite rub. I used Meat Church’s “Deez Nuts” for the rub! Preheat the Big Green Egg to 450° and use a raised grid over direct heat. Place the Pork tenderloins on the raised grid and let cook 30 minutes or until the temperature reaches 145° on the Thermapen. Make sure to check the Pork tenderloins every 10 minutes and turn so all sides get cooked. Now slice this bad boy and serve! This is an excellent recipe to cook on the grill. In a large bowl, toss the mushrooms with olive oil and season with salt. Place the mushrooms in a roasting pan and cook in the oven until the mushrooms are caramelized, around 20 minutes. In a large mixing bowl, toss the roasted mushrooms with the garlic, lemon juice, parsley, celery leaves, microgreens, cheese and croutons. Place the slices of Prosciutto on top of the Pork Loin. Once cool put he Panzanella on top of the Prosciutto lined and butterflied Pork Loin. Roll the Pork Loin up being careful not to lose the filling. Tie the Pork Loin with butcher's string. Cover with your favorite rub. Preheat the Big Green Egg to 450° and use a raised grid over direct heat. Place the Pork Loins on the raised grid and let cook 30 minutes or until the temperature reaches 145° on the Thermapen. Make sure to check the Pork loin every 10 minutes and turn so all sides get cooked. Let rest for 10 minutes. Slice. Serve. Great looking pork! I’ll have to try this out next weekend. Thanks for the comment Danny! Let me know how the recipe turns out for you. Thanks Don and good catch as this is indeed a tenderloin and not a loin. We wouldn’t want to disappoint anyone!